A client sent us a .MP4 video, made of 10 frames and text, which loop 3 times. Since we need to edit the text (translate it into another language), the client sent us a .PSD source file, also containing 10 frames / layers. 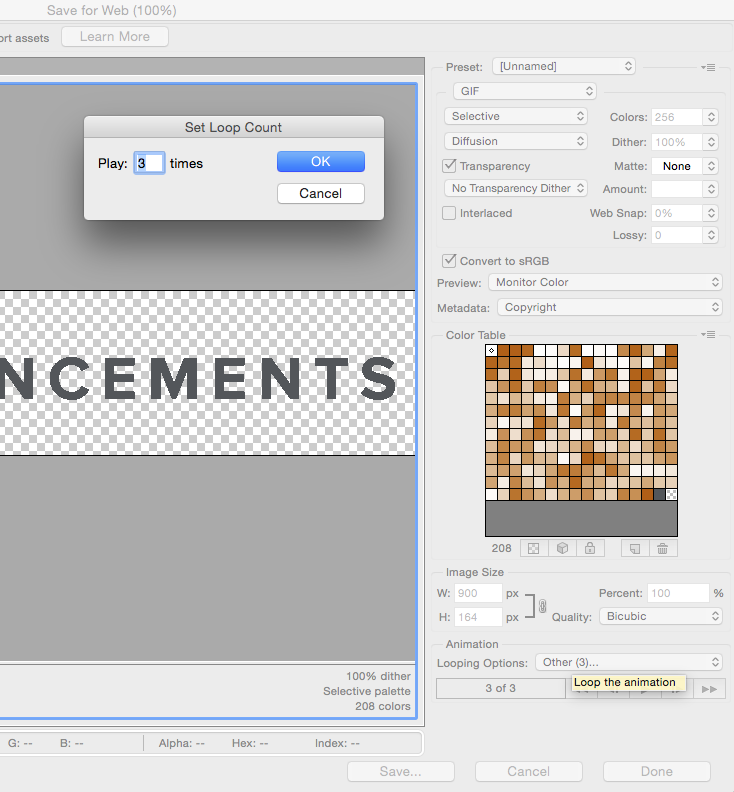 We assumed we would need to work with Photoshop CS6 to edit the text (since the source file is a .PSD, see above). However, when we try to render the video as .MP4, there is no loop. Is there a particular option to check to preserve a loop when saving a file with Photoshop CS6? Is Photoshop CS6 at least the right tool for the job? The other is when you use the "Save for Web" command, and save the file as a .gif animation. Near the bottom right is the "Looping Options" dropdown, where you can choose "Other" to select the number of times you want the animation to loop (if you had set "3 times" in the Timeline window, this setting will already be set to (3) as you see here, but you can choose any number you want in this area). There is no "save for web as an MP4" option in Photoshop. So your question is unclear. You can duplicate the animation two more times in Photoshop then render the video. That way you render the video with 3 cycles. Not the answer you're looking for? Browse other questions tagged adobe-photoshop cs6 animation video or ask your own question. Can I extract and save background of a png image in photoshop? How do i export text from illustrator to photoshop with editable text and layer style?